For energy reform to succeed in Germany, cost-effective, efficient and practical energy solutions must be found to deliver the green energy of the future. 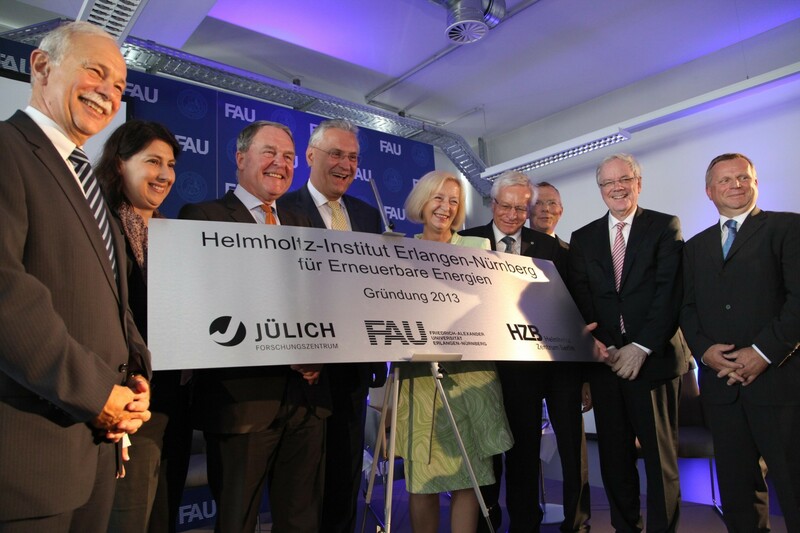 FAU, Forschungszentrum Jülich and Helmholtz-Zentrum Berlin (HZB) are taking an important step to achieving this. Together, they have established the Helmholtz Institute Erlangen-Nürnberg for Renewable Energy (HI ERN). In the presence of Federal Minister of Education and Research, Prof. Dr. Johanna Wanka, the three Bavarian ministers Dr. Wolfgang Heubisch, Joachim Herrmann and Dr. Markus Söder with State Secretary Katja Hessel signed the co-operation agreement between all three partners today in Nuremberg. The Helmholtz Institute Erlangen-Nürnberg is at the centre of the co-operation between the three organisations who are sharing their expertise in the field of renewable energy. The new institute will be established on FAU’s southern campus in Erlangen and at the former AEG factory grounds in Nuremberg. It is a branch of Forschungszentrum Jülich and will employ 40 to 50 staff in the mid-term. The Free State of Bavaria intends to finance a new research building for the institute and fund operational costs during its foundation for a period of five years. The senate of the Helmholtz Association approved the establishment of the first Helmholtz institute in northern Bavaria at the beginning of June and will fund the institute with EUR 5.5 million per year for personnel, operational and investment costs. HI ERN will focus on two major research areas: printable photovoltaics and innovative methods for chemical energy storage using hydrogen technology. These are key questions for cost effective and wide-spread usability of renewable energy and the success of energy reform in Germany. The two Helmholtz centres in Jülich and Berlin will contribute their expertise in the field of materials research for solar technologies as well for hydrogen production from renewable energy sources. Research will also focus on hydrogen-related system technologies. FAU’s internationally renowned materials and process research will contribute to the exploration and development of renewable energy systems at HI ERN. 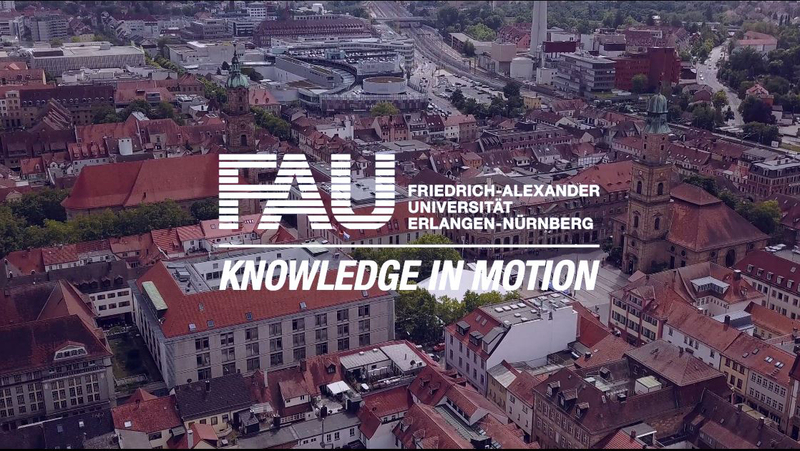 FAU’s Cluster of Excellence EAM (Engineering of Advanced Materials), established in 2007, has served as the nucleus for the new institute. With the Cluster of Excellence, the University has been able to achieve ground-breaking successes in fundamental research which are now to be used in the research and development of renewable energy systems. The collaboration between Jülich, Berlin and FAU will have an impact on joint research projects and appointments as well as the exchange of staff and students. The annual budget is to finance four professorships and two junior research groups. The new research building will house about 2500 square metres of laboratories and offices for the researchers. The Helmholtz Association is the largest research organisation in Germany and has almost 34,000 staff at 18 research centres and an annual budget of 3.76 billion euros to research the big questions facing society.